Snapshot for December 5, 2008. African Americans earn much higher wages in auto industry jobs than in other parts of the economy, and the loss of these solid, middle-class jobs would be a devastating blow. Hourly wages for African Americans in the motor vehicle industry averaged $17.08 (excluding fringe benefits) in 2007, versus economy-wide average wages for African American of $15.44 per hour.2 African Americans have been particularly hard hit in this recession. The unemployment rate for blacks increased to 11.2% in November, an increase of 2.8 percentage points over the last year, as shown in today’s EPI Jobs Picture. 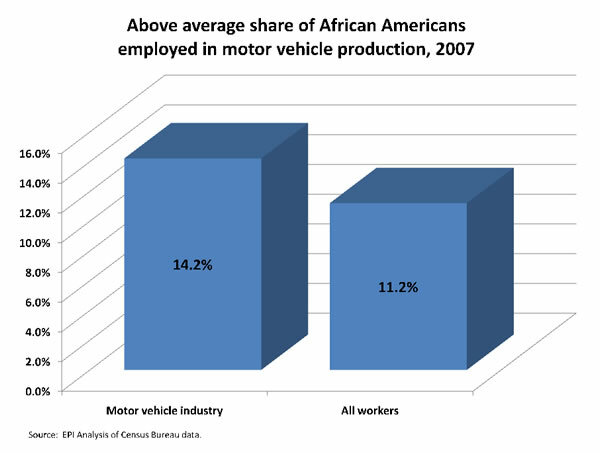 The consequences of an auto industry collapse—which could eliminate up to 3.3 million U.S. jobs, as shown in the Briefing Paper When Giants Fall—would be nothing less than catastrophic for African Americans. 1. Source: Bureau of Labor Statistics and EPI analysis of data from the Census Bureau’s “Current Population Statistics, Outgoing Rotation Group” data. 2. EPI Analysis of CPS ORG data.